BT decides to stick with the big guys. Alcatel-Nokia and Huawei have been #1 & #2 in DSL for a decade, both with excellent products. They both jumped in early to G.fast and their gear works well. They've now won the next stage of BT's 10M home servable G.fast offering, another 100,000 homes in the next six months. BT's Seeley is hopeful they will get production amendment 2/3 chips, but their main supplier Broadcom is not committed to delivering the chips so soon. Ray Le Maistre, a first rate British reporter, believes Adtran has a chance to get back in at the next stage of DSLAM procurement. No word yet on which modems will be used. Arris/Pace and Technicolor are hopeful. Nokia and Huawei do not generally build their own modems, I believe, but instead OEM them. BT may be willing to pay the markup for now. There's still plenty of system work to do and they are sensibly cautious. BT has surprisingly few choices. The vendor community has shrunk drastically. I know only four DSLAM makers and two chip vendor likely to be ready to serve a customer like BT. AT&T is addressing the problem of fewer vendors by doing more of their own R & D. They have a huge team working on Software Defined Networking and are major contributors to Open Source software. They also built their own DSLAM for SDN testing. BT, especially Trevor Linney, has taken a key role in the design of the standard, backed by essential research. 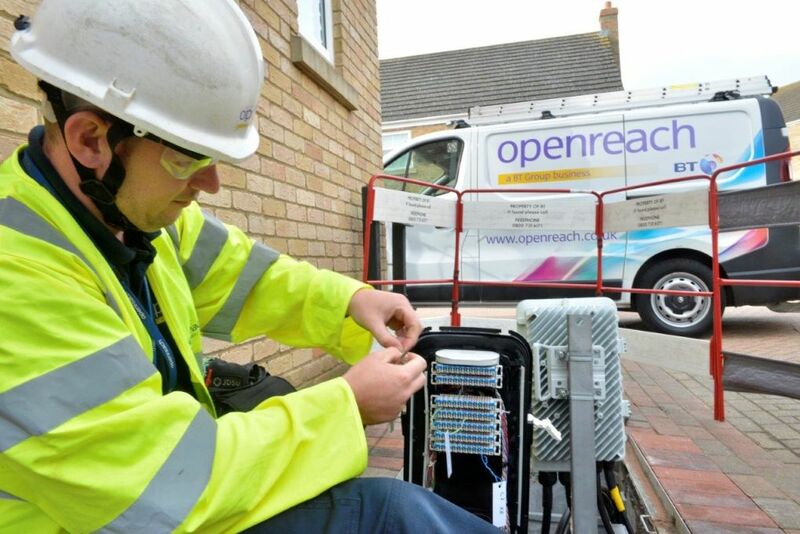 Telcos worldwide are now paying the price for two decades of cutting back R & D.
The companies, which have been working with Openreach on the world’s largest trials of ‘G.fast’ technology in Huntingdon, Gosforth and Swansea, will provide cutting edge switches, modems and cabinet ‘side pods’ to help deliver download speeds up to 330Mbps – more than 20 times the current UK average – to 10 million homes and businesses by the end of 2020. The new kit will be rolled out in parts of Gillingham and Cherry Hinton later this year and will help Openreach deliver its ambition of getting ultrafast broadband of at least 100Mbps to 12 million premises in the same timeframe, and the majority of the UK by the end of 2025. Clive Selley, Openreach CEO, said: “Openreach is pioneering G.fast technology because we want to get affordable ultrafast speeds to as many people as possible in the fastest possible time. “We also want to deliver this next generation of broadband services in the most efficient and least disruptive way – so it is a testament to our world leading R&D team that they’ve managed to define and drive new standards with operators and equipment manufacturers around the globe. Today, more than 91% of homes and businesses in the UK have access to superfast speeds of 24Mbps and above, whilst the Openreach fibre network is available to more than 25 million homes and businesses. More than 100 different communications providers (CPs) are offering services over the company’s open wholesale fibre network, and all CPs will have access to these new ultrafast services under the same terms, conditions and pricing.